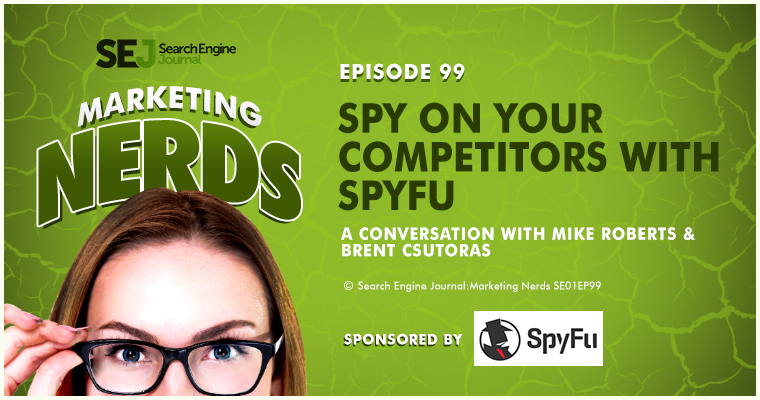 This Marketing Nerds episode was sponsored by SpyFu. In this week’s sponsored episode of Marketing Nerds, I am joined by Mike Roberts, Founder and CEO of SpyFu, a popular keyword research tool. We talk a little about where the concept of SpyFu came from, its evolution, and some of the unique ways you can use the tool’s information to improve your marketing efforts. You can go to SpyFu and type in any website and see every keyword that they’ve ever bought on Google. You can see all their organic keywords and how those have changed over the last 10 years. You can pinpoint any sort of Google algorithm change and how that effected a website. You can also see how a company started their AdWords campaign and how they changed their ad copy and changed their keyword groups to squeeze out the highest conversion rates. Ultimately, the goal is to spy on your competitors and figure out their secrets. Often times, we get focused on like, “Well, this guy is my direct competitor across the street.” Or you’re at Search Engine Journal, so you might be looking at Search Engine Land. Often times, what you really want to look for are people who you admire. You want to look at the ones who are, executing well or growing fast. 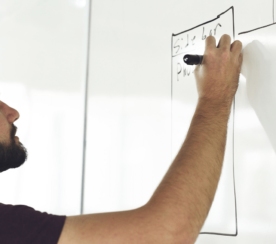 From your perspective, a competitor you might not think about would be, like, Wordstream or Moz or Quick Sprout, who, have really great content marketing campaigns. You might look into their content and try to find their best Evergreen content and see if you can improve upon it. Any examples of people using SpyFu in an effective and useful way? 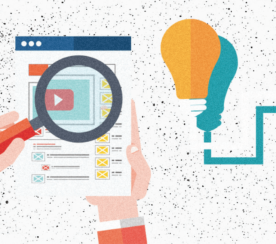 In terms of PPC, there’s two core things that are, sort of, advanced or things that people should use. SpyFu is used to spy on your competitors and download their keywords. That’s core to our model. Right? Everybody knows SpyFu for that. The reality is, if you want to be really successful, you need to look at what has worked in other people’s AdWords campaigns. The thing is, we have the entire AdWord’s campaign history, meaning, everything that they’ve ever done on AdWords, we have for nearly 99% of domains. Right? Just as an example: Groupon. We’ve been collecting data for four years longer than they’ve been a company. As a result, we have their very first ad they ever ran on Google. Then we have every test that they’ve ever run, every split test. We have their A, their B, their C, their D, all they way through their first keyword. You’re looking at 22 different tests you can tell which one won, over all that time. The ad copy is, actually, the greatest predictor of quality score. Focusing on improving your ad copy and figuring out what didn’t work, is a sure way to figure out what is going to work for you. It’s called SpyFu Ad History. We have that for domains. We also have it for keywords. You can look at an individual keyword and see everybody that’s ever advertised on that keyword. Take that Groupon example. I think their first keyword, it’s like Daily Deals or something like that, right? If you look at Daily Deals, if I were to pull it up here in SpyFu, there’d probably be something on the order of 50 advertisers or so who have advertised on that. Each of those guys, you’ve got Groupon, and then you’ve got Living Social, each of those guys is going to have 15 different ad copy tests that they’ve run. You’ve got everything that’s ever been tested on that keyword. You can figure out, “Well, they ran this one for a few months and then they ran this one partially.” You can see it intermingle in there when it’s running 50-50. Then you can see the one that they decided on and then you can see the next evolution and so on and so forth. Any other areas that jump out as not so obvious, but extremely valuable? On the AdWord side, the most valuable tool we’ve ever built takes all these lessons about history and about things that your competitors are buying, the idea is that looking at a single competitor is interesting. If they’re doing something and you’re not, you could look at that. When many of your competitors are all betting their money on the same keywords and you’re not, that is a really strong signal to look at that keyword. In addition, if you factor in that they’ve been buying it, repeatedly, over time and increasing their positions and increasing their bid, then that’s the strongest possible signal. We’ve taken all of that wisdom, all of that knowledge, that we’ve learned over the last 10 years of doing this, we built it into a single report. This is called the AdWord’s Advisor Report. 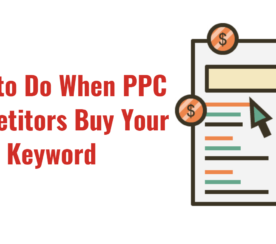 What it does is, it tells you, point-blank, “You should buy these keywords.” It gives you a list of the top keywords that you’re not buying, that you should. It even tells you whether or not you should buy the phrase match or the modified broad or just buy the exact. It tells you those things, it tells you how much traffic you’d get and how much you’d spend. It also tells you, “You know what? None of your competitors are buying these keywords that you’re showing up on. You’re probably broad matching into them, you should use negative matches.” This is a simple report. All you do is, you type in your domain and it selects the competitors for you. You run the report, then it gives you this advice. It’s point and click, super simple. It takes all that stuff and makes it really easy. Interestingly, this is sort of the same type of thing that Bid Management Tools will do. If you use, Quizzio, WordStream, or Morin, or something like that, they’ll give you really good advice. For people who don’t know the history of the Google API thing and the Raven Tools thing, Google, kind of, enforces this separation of church and state. If you open up Majestic or Moz or whatever and you put in your competitor’s domain, and you’re like, “I’m going to go through here and I’m going to find out whether they have some links that would like to get.” Or, however, you want to start this process. If you go in there you end up seeing millions and millions of backlinks from all over, like, every dark corner of the internet. You can look at the Domain Authority and try to figure out, “Which ones of these might work for me?”, but you really don’t know that much about those links. You have to research each one and it really kills the productivity of the whole thing. Right? First of all, there’s a whole bunch of duplicates. You might be looking through there and you have to scroll through many, many pages to find things that you need. We built a backlink tool about 2 years ago. The guiding principle was, Let’s only show you backlinks that are going to be safe for you. Let’s never show any duplicates, either. Let’s just make the thing as highly productive as it can possibly be and make it so that you never have to worry about if this link is going to get you in trouble. The core reason that these are safe backlinks, is that they’re all indexed by Google. They’re, currently, indexed by Google. What’s interesting about that is, because we have our other database, we have the SpyFu database, is we know exactly what the authority, what’s the link equity from that link going to get you, because we know what every page ranks on. In-post Photo: Image from SpyFu.com. Used with permission.